Before I get stuck right into this review, let it be known that I really don't like this game. It isn't horrible, but if my copy were to break/get lost/stolen, I wouldn't be in a rush to replace it. 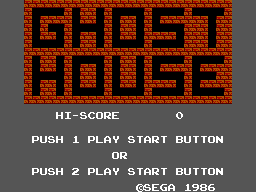 Anyway, in Ghost House you take control of Mick, a little boy sporting a most bizzare hairstyle, searching a mansion for his 5 "family jewels." To claim his prize, Mick will have to punch through tiny but abundant bats, strange blue blobs, red, round fire-breathing... uh, things, and wave after wave of Draculas. Get the jewels, find the secret door, lather rinse repeat. Gameplay is nothing unique. 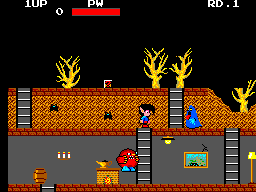 You'll climb ladders, jump on platforms and punch monsters. Start by defeating enemies until they give up a golden key. Take the key, find a coffin, defeat its occupant and take the jewel. Now, find another key. Simple enough, but the little things add up and manage to drag the game down. The monsters are, for the most part, plain and boring. The blue "Deaths" just move back and forth, waiting for a single punch to end their little lives (or little deaths, dunno.) The red fire-breathers are more interesting. Jumping around like they're on caffine pills, these guys will breathe a blast of fire if you get to close, and an instantly fatal fireball if you hang around for too long. Four punches will do him in. If you make it past the first level, you'll meet the mummies. They chase you up and down ladders, and their punches have a huge range. The tiny bats can be hard to hit, but end up killing themselves should one make contact. The Draculas don't mess around. They can fly around as a bat, swooping from above. When he lands he resumes his "human" form, where, if you don't have a knife, can push you right into a corner, leaving you trapped until your life bar runs out. The best way to attack them is to hit one of the lights, causing all monsters to freeze, and punch away. When he dies, DO NOT punch or jump on his heart, as he could very well come back to "life" (he'll even do this for no apparent reason. Fantastic.) 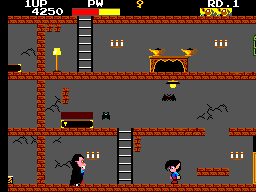 During play missiles and knives will fly in from the sides, which you can jump on for points, and in the case of the knife, a stronger weapon. Why he throws the knife away after a few jabs I don't know. During play expect to fall through the floors. I have no idea who thought this was a good idea. If you're lucky you won't fall into the bottom floor's lava pits (?!). In some instances you might find yourself having to walk through the flames, which Mick does in a very stoic and unflinching manner. To add to the... uh, "fun", teleporting doors are scattered all about. Only problem is getting the teleport to work before some monster comes and knocks you away. Nothing worth mentioning here, but keep in mind this was released on the card, so what do you expect? The monsters are rather un-detailed and the walls bare. The music is actually very good, setting the (intended) mood appropriately. Sound effects are a different story. The bouncing sound the fire blowers make and the high-pitched squeak made after every footstep will get to you. Nothing wrong here. Use left/right to move, up/down to climb ladders, down to duck and left/right to then crawl. Punch/stab with button 2 and jump with button 1. As I said, this game isn't my cup of tea. A simple concept riddled with flaws. However, this game does seem to have its fans, so try it out for yourself.